Day Four: Love that is persevering, enduring to the end. Opening Prayer: Father, by the blood of your own Son, Jesus Christ, you have set us free and saved us from death. Continue your work of love within us, that by constantly celebrating the mystery of our salvation, we may reach the eternal life it promises. We ask this through Christ our Lord. Amen. Scripture Reading: Romans 8: 31-39 Nothing can separate us from the love of God in Christ Jesus, our Lord. John 13: 1-17 Jesus would show His love for them to the end. Reflection: We see many unfinished buildings, unfinished projects throughout Africa. Sometimes it is just that it is slow, and the funding money is not available. Or, a project is started, and a new governor comes in, and the project is abandoned. On a more personal level, sometimes we fail to follow through on our promises. We get distracted, we move on to something new. We forget, we lose interest. But God’s love is faithful, enduring to the end. We gain insight into the persevering love of God from the prophet Isaiah. Can a mother forget her infant, be without tenderness for the child of her womb? Even should she forget, I will never forget you (Is. 49:15). The public life of Jesus is marked by love for His apostles and disciples, marked by love for the crowds. This love would persevere and continue till the end. Our Scripture reading from the gospel of John affirms this as Jesus continues His journey to the city of Jerusalem. There He will meet rejection and death. Jesus realized that the hour had come… He had loved his own in this world, and would show His love for them to the end. He did not turn back, did not slow down, did not shrink from what lay ahead. No, He manifested and practiced His love to the end. This quality of the Heart of Jesus is one we seek and need in our lives. One beautiful example of love that remains faithful and perseveres to the end comes from Liv Ullman, a film actress. She saw a photograph of an old couple. The wife is in bed, and almost in a coma, living in another world, her eyes are empty. The husband on the bedside with a bowl and a spoon and he is feeding her, and looks at her so lovingly. He is making a quiet statement about his love for her. He is saying that what we once promised each other when we were young – love in sickness or in health – remains strong even today. Liv Ullman would like to make a movie from that picture, and she calls it the strongest and most beautiful statement of love that she had ever seen. 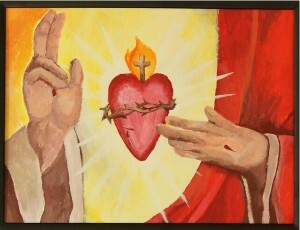 May we imitate the ever-faithful, enduring love of the Sacred Heart. Resolution/Practice: 1. At the end of each day, resolve to spend five minutes reviewing the day. Thank God for the good. And if there is any unfinished business,= any obligations which I still have to fulfil, ask for the grace and strength to persevere to the end in bringing to completion what I have begun, what I have promised to do, or what I am obliged to do. I pray for a loving heart that follows through, and perseveres to the end, a heart like the Heart of Jesus. 2. Prayer every day for the grace of final perseverance… For example, in the Hail Mary, we say: Pray for us sinners, now and at the hour of our death. Amen.